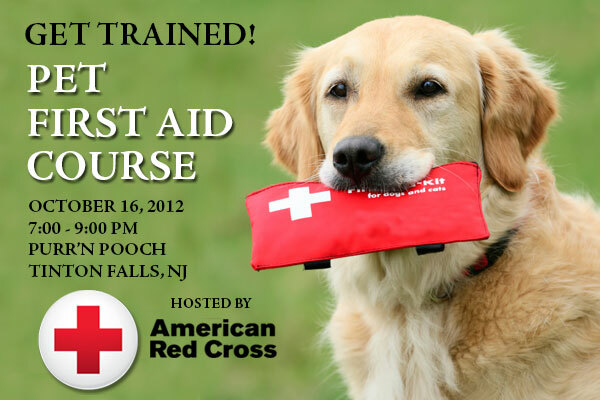 The American Red Cross of New Jersey will host a Pet First Aid Course at Purr’n Pooch Pet Resorts in Tinton Falls on Tuesday, October 16, 2012 from 7-10PM. The cost per student is $70 and registration will need to be made online at www.redcross.org or via phone at 800-REDCROSS. Learn how to respond to health emergencies and provide basic first aid for the four-legged members of your family. Practice and preparation will help you be calm and effective in an emergency, protecting you and your animal from further injury or suffering. Choose from: Dog First Aid, Cat First Aid, and Cat and Dog First Aid. Course length: 2 1/2 – 3 1/2 hours depending on course option selected. Just like with people, accidents and emergencies can happen to animals – so being prepared could make a lifesaving difference. For more information about Dog First Aid training and Cat First Aid training or to register for a course, contact your local American Red Cross chapter. Every participant will receive a complimentary book and dvd to take home. The American Red Cross provides assistance and guidance to people whose pets are ill, injured or in life-threatening situations. The illustrated Dog First Aid or Cat First Aid book outlines symptoms and procedures for common ailments and emergencies. The author, Bobbie Mammato, DVM, MPH is an emergency/critical care veterinarian who also has a Masters in Public Health. In addition to her duties as a part-time small animal practitioner, she is a disaster relief consultant to The Humane Society of the United States. A small section on tips for owning a healthy dog and cat concludes the book — choosing your pet, providing daily care, traveling, and even a brief section on when to say good-bye. Enter the Purr’n Pooch Best of the Class of 2012-2013 Yearbook Contest! Every month, through June 2013, your dog or cat is invited to enter our virtual yearbook and a chance to win a different monthly prize from Purr’n Pooch. Submit photos by September 15th @ 9 p.m. Voting begins September 15th @ 10 p.m. and ends September 22nd @ 9 p.m.
HOW TO ENTER: Submit a photo(s) of your cat or dog on our Facebook Page Contest Link. You can submit as many photos as you like by the submission date. The entry with the most votes will win the monthly class title of the month. September voting is for “Best Smile”. One vote per day. The prize is a Hydrotherapy Bath from Purr’n Pooch Pet Resorts. DEADLINES: Contest starts September 10th at 5 p.m. Submit photos by September 15th at 9 p.m. Voting begins September 15th at 10 p.m and ends Saturday, September 22nd at 9 p.m. PLEASE NOTE TO VOTE: If you are on the Purr’n Pooch Pet Resorts Facebook page to vote for your favorite entry, you need to like the page to vote in the contest. You can vote every 24 hours for your entry of choice. Still having problems? Make sure you have disabled the cookies on your computer so you can view third-party apps. The contest is a third-party app because Facebook requires you use one to run a contest within their promotional guidelines. At Purr’n Pooch Pet Resorts we believe that smart feeding choices are key to raising healthy and happy cats and pups. Poor quality and over processed foods can cause a host of issues for your pet, including skin allergies, digestive problems and chronic ear infections. We are pleased to announce that Purr’n Pooch now carries affordable quality food lines for your pet. We also welcome your special order requests. Blue Buffalo features real chicken, fish or lamb as the first ingredient. Jodes Happy Tail healthy homemade dog treats prepared with the freshest organic and all natural ingredients. Sojos a wholesome grain-free dog food that you simply mix with water to create your own fresh homemade dog food. Made with USDA freeze dried raw turkey and all natural ingredients. Stella & Chewys 100% complete and balanced nutrition. Raw, naturally raised meat, fish and chicken sourced from USDA inspected facilities. No grains or fillers. Taste of the Wild a grain-free formula with sweet potatoes and peas provide a highly digestible energy for your active dog. Whole Life Pet Products single ingredient pure protein pet treats. If you have any questions or would like to place an order for pickup, contact Helen Shields, Purr’n Pooch’s Retail Manager, at 732-842-4949 or retail@purrnpooch.com.